Google Street View, first introduced to the public in 2007, is a service and extension to both Google Maps and Google Earth that displays 360-degree images of various locations around the world, most notably streets and roads. With this application, one can view and explore all kinds of places, from popular cities in other countries to one’s own neighborhood, while the more adventurous can plan out bike or hiking routes using Street View. Such an application is only made possible thanks to the work put in by men and women around the world, known as Google Tricycle Mappers. 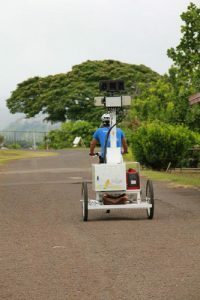 First deployed in 2009 after they replaced the Google Street View cars, these panoramic cartographers make their way through the world on a tricycle carrying a 360 camera taking continuous snapshots of its surroundings. 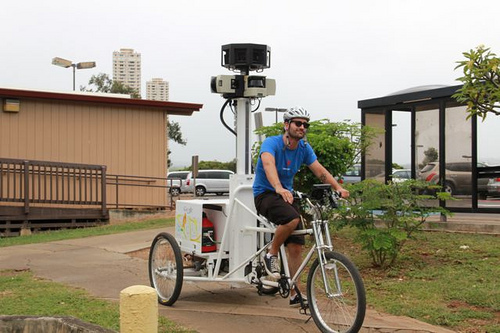 Google Tricycle Mappers are tasked with triking these cameras all over the world. This is no easy task, as these cameras can weigh up to 250 pounds. The obvious perk of such a job is of course being able to visit many exotic and popular tourist attractions from around the world. Mappers don’t even need to worry about recharging the camera, as it is powered by the biker’s own peddling. Google’s Street View Tricycles rendered the Street View Cars obsolete with their versatility and their ability to capture images of locations that would otherwise be inaccessible to a motor vehicle. Since the implementation of the tricycles, Google was able to capture images of the inside of various amusement parks, hiking trails, and the nooks and crannies of inner cities. While such extensive global recording worried those who fear being monitored, all of the images recorded by Street View are static, and in no way live footage. Google Tricycle Mappers consist of both Google employees as well as local contractors, although due to the physical requirements of the job, Google looks for athletes adept enough for such a strenuous job. Due to the sheer weight of the camera, the job is deceptively challenging, but it’s certainly worth it for a chance to work for one of the most prestigious companies on earth. What is a Chief Listening Officer? Theme Designed by InkHive. © 2019 Weird vocations. All Rights Reserved.